What better way to feel like a kid again than a grilled cheese sandwich? But this sandwich isn’t just for kids. This time, we’re adding a decadent twist and refining it for older taste buds. Bread: Get a nice rustic loaf with flavour to it – like garlic, rosemary, parmesan, sourdough or a good whole-grain. Try to cut to even 1/4 inch slices. Cheese: Go for bold flavours and shred for maximum meltability. Go for quality – the cheese is the star of the show. Try Fontina, fresh Mozzarella, Gruyère or Swiss. 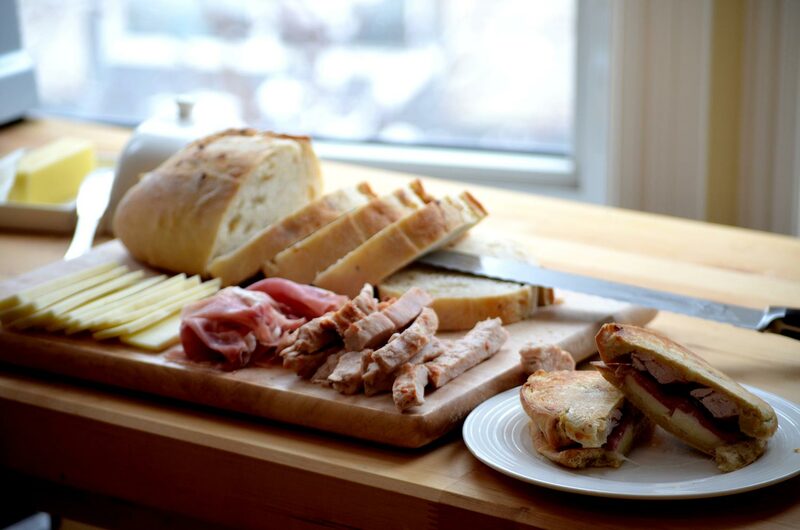 Meats: Try a nice sweet Ham (with Gruyère), Prosciutto (with Mozzarella) or cooked bacon to add some crunch. You can even add some sliced chicken or turkey to mix it up a bit. Set oven to broil. Set a wire rack inside a foil-lined rimmed baking sheet. Heat a medium skillet over medium heat until very hot. Butter 1 slice of bread and place in the skillet butter-side down. Press with spatula to ensure even toasting. Once browned, remove from pan and place one browned-side down on the wire rack. Top with toppings of your choice and place in oven until cheese is melted. Meanwhile, toast a second slice of bread in the skillet. Firmly press both sides of the sandwich together and enjoy!